The public is invited to Henry Ford Centennial Library on Saturday, February 6 for the kickoff of The Big Read–Dearborn, a communitywide initiative that will focus on 19th Century poet and mystery and macabre writer Edgar Allan Poe. The kickoff of The Big Read-Dearborn will be from 2 to 4 p.m. and will set the tone for a variety of fun and intriguing events centered on Poe that are planned for February and March 2016. Free refreshments, books, and the Do You Know Poe? tabloid, created by students at the Dearborn Public Schools’ Michael Berry Career Center. 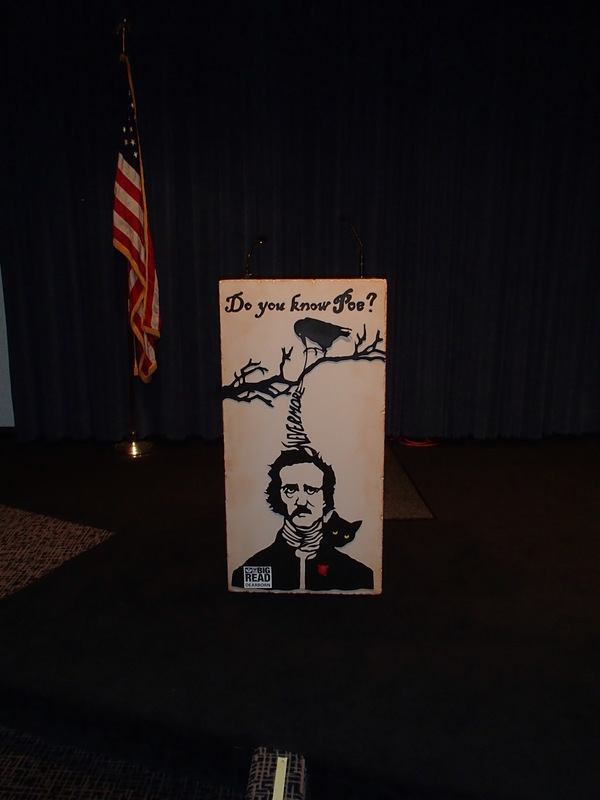 The Feb. 6 activities are designed to help people answer the question “Do You Know Poe?” which is one of the tag lines for the promotion of The Big Read. The Big Read-Dearborn encourages people of all ages to read for pleasure and enlightenment and engage in fun and interesting activities related to a selected book. The Big Read-Dearborn will use The Great Tales and Poems of Edgar Allan Poe as the centerpiece of the 2016 program. He also is considered the inventor of detective fiction and wrote early versions of science fiction stories. His writing has inspired many films. This is the second time for The Big Read in Dearborn, following the successful series of events in 2014 that focused on author Jack London and The Call of the Wild. During the Feb. 6 kickoff event, light refreshments will be served in the Rotunda area of the library, and the program will include brief remarks from Mayor John B. O’Reilly, Jr., Library Director Maryanne Bartles, and a representative from DFCU Financial, which is a major sponsor (Raven Level) of The Big Read-Dearborn. Additionally, Dearborn Public Schools faculty and students who worked on the tabloid will be called up to the stage for acknowledgement of their tremendous accomplishment. Visit bigreaddearborn.org to sign up for email updates and to view a full schedule of events planned for February and March. Click here for details and entry form. Click here to read the press release. Some details are listed below. Artist and art instructor in the Dearborn Public Schools, Mohamad Bazzi has exhibited his own paintings and been involved with dozens of community arts projects, public art installations and exhibits. Among the awards Mohamad has received are the “People’s Choice Award” presented by the Dearborn Community Fund’s 12 on 12 Art Event and the Artist/Performer of the Year awarded by the Dearborn Community Arts Council at the Dearborn Mayor’s Arts Awards. Professional and amateur artists, 16 years of age or older, are eligible to submit up to two works for consideration. Works can be all media 2-D and 3-D including photography and must be current (within two years). Submission of work(s) to the juror constitutes compliance with all the conditions stated in this prospectus. The juror’s decision is final. Accepted works will remain as placed by staff and will not be withdrawn until the close of the exhibition. An entry fee of $25 per artist, per entry, or 2 for $30 must accompany submission of not more than two entries. Checks should be made out to: Friends of the Library-Dearborn. Reduced entry fee for students with I.D. and Artists’ Society of Dearborn members. Details available at: http://www.artsocdbn.com. February 2: Art Submissions Due – Works must be delivered on Feb. 2, 2016, between 3 and 7 p.m. to Henry Ford Centennial Library, 16301 Michigan Ave., Dearborn, MI 48126. No work will be accepted after 7 p.m. on Tuesday, Feb. 2. February 4: If your work is NOT selected for exhibition, you will be notified by phone or email. Declined work must be picked up at Henry Ford Centennial Library on Feb. 4 between 2 and 4 p.m.
February 6: 2-4 p.m. Exhibition opens in the Henry Ford Centennial Library, Rotunda Gallery. Awards presented. February 25: 8:30 p.m. Exhibition closes. Entry form must be completed. Affix “Artwork” description card A and/or B to art. Accepted 2-D entries must not exceed 28” x 36” and must be matted, framed under Plexiglas (acrylic), and ready for hanging. Hanging wire must be used. No sawtooth hangers. Glass will not be accepted. 3-D vertical art must be no larger than 8”W x 16”D x 24”H. 3-D horizontal art must be no larger than 30”W x 10”D x 12”H. All work will be handled in a professional manner. Henry Ford Centennial Library will be responsible for works in its keeping through the entry process and exhibition period (Feb. 2 – Feb. 26, 2016). Works must be picked up between 4-6 p.m. on Friday, Feb. 26. Works left after Feb. 26 are not the responsibility of Henry Ford Centennial Library or the Artists’ Society of Dearborn. 20% of the sales price of any work sold during the exhibit will be donated to the Friends of the Library-Dearborn (FOLD). The Big Read Dearborn Open Art Competition is coordinated by The Artists’ Society of Dearborn (ASD), a Big Read Partner. To learn more about ASD, visit: www.artsocdbn.com.